After attempts #1, #2, and #3, I can safely say that I have finally figured out why the bread wasn’t as fluffy as I would like. One of the key ingredients in creating a good croissant is yeast and in order for the yeast to perform it like the way it is supposed to, you need to know how to activate it properly. In my previous attempts, I did not heat the milk warm enough before putting the yeast in it and that prevented the yeast to reach its full potential. In this latest attempt, I have noticed that the bread was definitely a lot more fluffy and I am now getting the croissant to look/feel the way I want so I am hoping that after a few more tries I will get it to the final state. 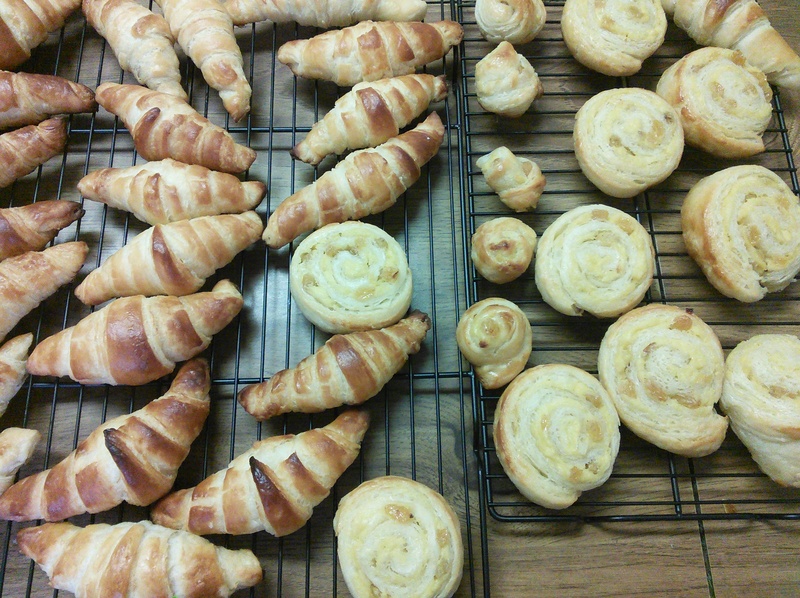 Categories: Food & Sweets | Tags: butter, CooknwithClass, Croissants, France, pain au raisin, Paris, pastries | Permalink. After attempt 1 and attempt 2, I have gotten a bit more comfortable with managing the croissant dough. I have noticed that the change in butter made a huge difference but I am still struggling on the lamination method which is where you incorporate the butter into the dough. If it’s not done correct, the buttery layers expand the way it is supposed to. Since I have only been making butter croissants, I decided that for this attempt I use some of the dough and make pain au raisin (raisin bread). I’ve managed to make the pastry cream and incorporated it along with the raisins into the dough. However, I have not been able to get the golden brown colour on the top of the bread despite using a lot of egg wash. It is a bit of a mystery to me but I am hoping to solve it on my next try.